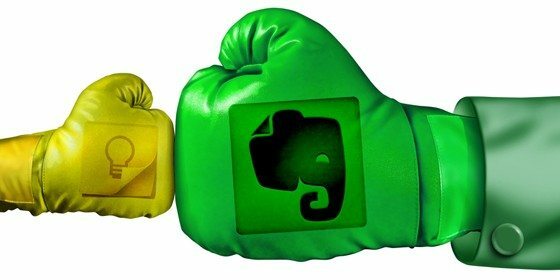 When Google Keep came out, there was a lot of buzz around it being competition for Evernote. It’s not. At least in its current state. If you’re a fan of Google Drive and don’t mind putting all of your digital eggs into Google’s basket, Keep may be for you. Let’s take a look. (All screenshots are showing the desktop versions of Keep and Evernote. Check out Mashable’s review and screenshots comparing the mobile versions. Google Keep’s mobile app is currently available to only Android users, but the desktop version is annoyingly limited. Evernote is available on Apple, Windows, Android and Blackberry (sigh) mobile devices as well as their desktop versions. 5 GB free storage within Google Drive versus 60 MB per month for free users and 1 GB per month + you can purchase an additional 5 GB if you are a premium user. Keep syncs with Google Drive although it’s kind of difficult to find the desktop version without visiting the direct URL through Google Drive. Evernote syncs with all of your devices on multiple platforms. Notebooks, like those found in Evernote, are sorely missed in Keep. There are no notebook or stack options in Keep. You can only view your notes in either a grid or list format. That colored line at the top of each note that you can edit doesn’t cut it. If you rely on tags in Evernote, Keep is out. The search capabilities in Evernote using keywords and tags is a massive feature that Keep just can’t compete with. Keep does allow you to archive notes, but it’s just an additional page within your Google Drive. Both Keep and Evernote allow you to create notes based on text, audio, photos or attachments in the mobile versions but what you can’t do with the notes on Keep’s desktop version is add other elements to a specific note. What happens if you want a photo AND a checklist? Let’s not forget OCR capabilities of Evernote that can convert your handwritten notes into actual text that is searchable. Google, at least for now, doesn’t. Hands down, Evernote gives you more options and flexibility overall. I’m going to be frank. Photo options in Google Keep are a hot mess. I went in to add photos a few photos but Keep sticks to a square format. Evernote’s Trunk and the premium Evernote account upgrade allowing you to work with Evernote the way you want to. Who knows, maybe there’s more in the works for Google Keep. Frankly, I’m a tad bitter over Google Reader, but I’ll keep an open mind I suppose. It’s safe to say I won’t be switching to Google Keep any time soon. Apples to apples Evernote is still leaps and bounds ahead of where Keep is right now. Have you tried Google Keep? If so, I’d love to know your thoughts and if you’ve tried both Keep and Evernote. Leave me a comment below!